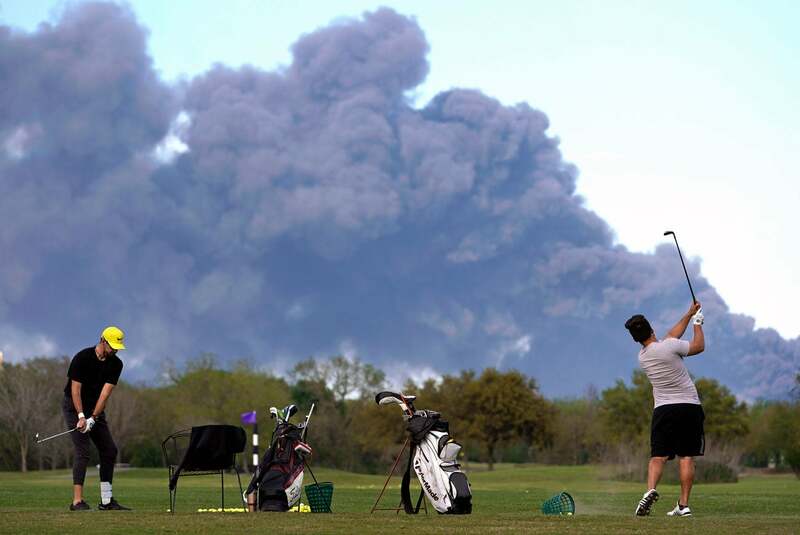 Golfers practice at the Battleground Golf Course driving range as a chemical fire at Intercontinental Terminals Company continues to send dark smoke over Deer Park, Texas, Tuesday, March 19, 2019. 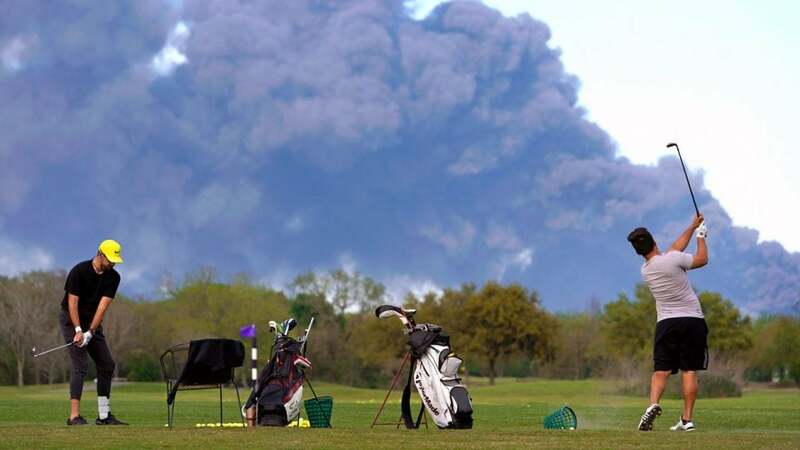 A dangerous chemical fire continues to burn outside of Houston, Texas, but that’s not stopping a couple of hardy golfers from getting in some practice on the range. The incident began Sunday at Intercontinental Terminals Co. in Deer Park, Texas, when several tanks holding industrial chemicals caught fire. The blaze sent massive plumes of ominous black smoke high into the sky. You’d think people would be wary of going anywhere near those toxic smoke clouds, but, based on the photo in question, you would be wrong. On Tuesday, photographer Melissa Phillip of the Houston Chronicle captured two golfers practicing on the range at nearby Battleground Golf Course with giant plumes of smoke from the chemical fire towering above them. The full photo shot by Melissa Phillip. Despite that warning, Harris County Public Health officials said in a statement that the risks are low for local residents “because the smoke is several thousand feet above the ground.” However, they do warn that anyone experiencing suspicious symptoms should contact their healthcare providers. There are no reports of any damage to the golf course, which is fortunate considering the seriousness of the blaze. Two historic golf clubs were not so lucky over the last year. The clubhouse at National Golf Links on Long Island was damaged by fire in April. Then in December, the ancient clubhouse at legendary Machrihanish Golf Club in Scotland burned to the ground.